The Victoria St Linear Park has been saved from the clutches of Auckland Transport. You may recall that we’ve been concerned about ATs plans for the future of many of the streets in the city centre for some time. In particular we were concerned that many of ATs emerging plans seemed to completely ignore the Council’s publicly consulted City Centre Master Plan (CCMP), and even their own strategic plans. This included denuding one of the CCMPs flagship projects, the Victoria St Linear park which would become an essential urban space linking the city centre’s two largest green spaces, Albert and Victoria Parks. It would see Victoria St narrowed down from six to just two lanes, with the rest of the space dedicated to people. The Linear Park, at least in this central section, is actually more of an enhanced urban space or a plaza than a park and among other things, is needed to help distribute the thousands that will stream out of the new Aotea station and likely a future Light Rail station on Queen St. The route was also previously identified as one of the key routes in the government’s Urban Cycleway Programme requiring it to have dedicated bike infrastructure. We thought our minds had finally been put to rest back in late March when the council reaffirmed their support for the City Centre Master Plan, including specifically calling out the Victoria St Linear Park. We thought this would be enough of a message to make AT think twice about scaling back the Linear Park. However, just days later, AT announced consultation for a plan which had a preferred option that not only killed the Linear Park but would also make it harder to use buses. What’s more, it appeared that part of the reason for this was a closed door deal done between AT and the University who don’t want buses past their premises, or even on the same side of the city as they are. We later learnt that ATs own business case for the project didn’t support their preferred option. It showed, thanks to some poor redacting, that the preferred option was so bad for buses it had a negative benefit cost ratio while cheaper and more logical options performed well. We, Generation Zero, Bike Auckland, Spinoff, and others encouraged people to submit to help save the Linear Park. Late last week we finally learnt the outcome of the consultation with AT stating that they received more than 2,200 submissions, an impressive effort. Most importantly, as a result of the submissions, which they say showed “overwhelming public support for a more green and cycle/pedestrian-friendly city centre“, AT have abandoned their plans for buses on Victoria St and therefore the Linear Park is still alive. More than 2200 submissions were received on the bus route options and the clear message from Aucklanders was that they wanted bus routes that also balanced the opportunities for a pedestrian and bike friendly city. In particular, this feedback sought that buses were not required to use Victoria Street, thereby enabling greater quality space for pedestrians and cyclists, as well as green space. Mark Lambert, Chief AT Metro Officer says public transport is working for many Aucklanders. “In March for the first time more people entered the city centre using public transport than came in by car. Retaining the Linear Park is a fantastic outcome so thank you to everyone who helped us in pushing for this outcome, although it is a situation that never should have arisen in the first place. 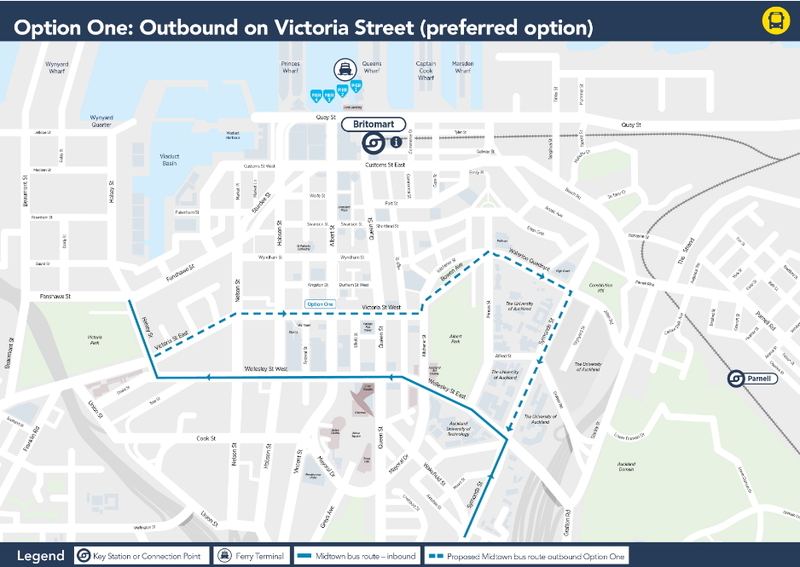 While AT are no longer planning on using Victoria St for buses, it seems they haven’t fallen back on one of the options also consulted on and have instead come up with a completely new option. Unfortunately there’s not a lot of detail on just what this entails but here’s what AT have said. The new option, which was not part of the initial consultation, removes the need for buses on Victoria Street by swapping some major bus route groups within the city centre and developing a new bus facility in Grafton Gully. 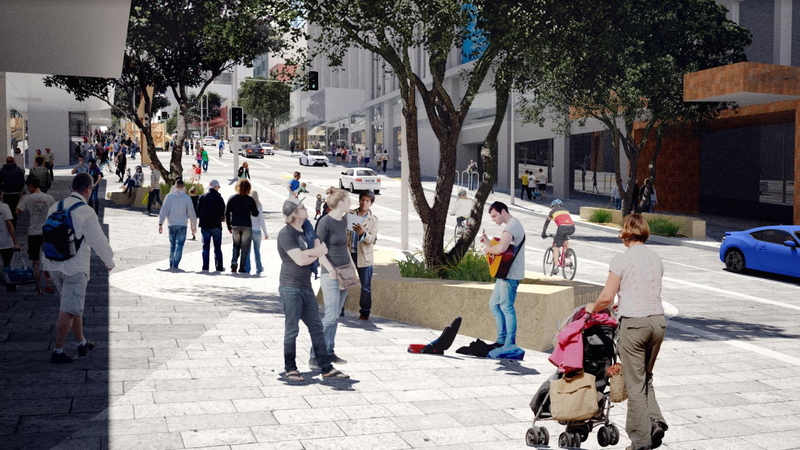 This option is still at feasibility stage and AT intends to further investigate, in particular assessing the operational requirements to ensure the proposal can work and will develop up the design of this option – in conjunction with Auckland Council investigating design options for Victoria Street – and bring this for further public consultation next year. In September, Auckland Transport will present these emerging investigations as part of a cross-Council reporting to the Planning Committee on progress on the City Centre Masterplan. Based on what they’ve said it’s hard to speculate on just what AT have cooked up now for buses in this area and whether it is once again just another option to get them out from doing the job properly. We’ll certainly be keeping an eye on things and it looks like we won’t have too long to wait to find out. Once again thank you to everyone who helped us save the Linear Park, it will look fantastic emerging from Te Ara Tomo (the tunnels under Albert Park). “The new option, which was not part of the initial consultation, removes the need for buses on Victoria Street by swapping some major bus route groups within the city centre and developing a new bus facility in Grafton Gully”. One idea I had (which I only thought of after consultation had finished unfortunately) was sending all South/Isthmus buses down Symonds Street/Anzac Ave to Customs Street (and then perhaps onto Wynyard Quarter via Fanshawe), leaving Wellesley Street to be served only by buses from the shore (including all NEX buses after Aotea station opens) and the Outer Link (or Crosstown 4). I wonder if AT have come up with some sort of (perhaps less drastic) version of that? Admittedly I’ve not checked how many buses that would be, but it does sound like it would be a heck of a lot on one small road, going to one small area (ignoring the depot there for now, as it’s not AT owned). I’ve a soft spot for Symonds/Anzac – I think that it wouldn’t take much change to make it a really nice area. Hopefully once the apartment building is finished the area will receive a general tidy up. Great result – but oh dear! Why does it take citizen activism to push back on this (and every other half-baked scheme) when AT are supposed to be the experts on urban and transport issues? Like central government they seem to come around after much kicking and screaming and dragging of heels. +1 Exhausing, eh? Public consultation can be used as a way of whittling down the public’s resolve and using up their energy. For something like AT’s transport options for the area that so glaringly ignored the CCMP, you’d have to wonder if this is the dirty politics that’s involved. I’ve noticed this a couple of times now. The Mount Albert town centre and the Northcote Point cycleway are a few other examples. I know it’s not relevant to this discussion, but what was the result on the public consultation in Mount Albert? I used to live there and I submitted for the solution suggested by Generation Zero but I don’t actually know what the result was. We have chosen to proceed with a right turn from a combined straight through and right turn lane on New North Rd in to Mt Albert Rd – option 1 during consultation. The right turn will be permitted at all times (not restricted to certain hours of the day). This option includes full length cycle lanes. Yes, quite. I see AT have put out a request for tenders to deliver a revised ferry strategy for Auckland: https://www.gets.govt.nz/AT/ExternalTenderDetails.htm?id=18915181. Maybe someone reading this can win that contract and get them on track. Let’s hope the eventual strategy includes the Waiheke ferry and it finally gets on the same footing as other public transport in Auckland. Midtown Slide? – and let’s have one! There is something cute about Victoria and Albert! It also means tide in Italian. Waves of people coming in and out. Let’s not confuse the situation by calling it “Te Araroa”! We already have a Te Araroa – it’s the national walkway running from Cape Reinga to the Bluff, and passes through central Auckland via Princes Street and the University. A bus facility in Grafton gully sounds suspiciously like it will slow buses. I think as a general principle, when AT come up with a bus option, they should ask the question “would we be Ok with this if it was LRT?” We know they are planning an uncompromisingly high quality corridor for the LRT routes, and rightly so. The same quality should be applied to bus routes, particularly those on major arterial and in the CBD. Thinking more about this, I can only assume they are going to run some routes up Grafton Rd. That might be ok if they put continuous bus priority through there. The best option for that might be median bus lanes or bidirectional on the northern/ eastern side of the corridor. We will see. This must be the plan surely? To take all of the buses on Park Road to Wynyard Quarter via Grafton Road and Wellesley and to take all of the Symonds Street Buses to Britomart via Anzac Avenue. Yes wonder what they come out with, quite interested in how the buses can all work in the central area. Perhaps the dominion Rd one will swing left down K’rd then queen rather than down symonds. IIRC AT is looking at a stop on Wellesley Street pretty much under the Symonds Street overbridge to act as a terminus for North Shore services. And if the busway was ever converted to LR, and LR built up Symonds Street to Mt Eden or wherever, then this would be a significant, two-level RTN interchange point. Not aware that any decision has been taken on this, though. The money spent on this so-called park is simply money diverted from much more worthy causes, such as all-weathering more sports parks, installing turf cricket pitches, or flattening bumpy parks into better surfaces. I am as pro-park, pro-greenspace as you can get, and I am annoyed and irritated that there is money in the kitty for this when local club cricket teams are forced to play on artificials 90% of the time because Council won’t put in proper pitches. There will more people using the linear park on Victoria street each day than likely use the cricket pitches you talk about in a year. It’s more than just a park it’s an urban realm servicing the entire resident population of th central city as well as the tens of thousands arriving by train and bus to th Victoria Street stations. Come now JDELH – this is about improving the street environment to cope with tens of thousands of people pouring out of the new Aotea station every day of the year. It is a transport project with contribution from the inner city targeted rate. By all means lobby for better sports fields but this is from a different pot. So can we rob the Sport budgets to fund transport projects in return? Are they not financed from different sources? Auckland Transport and Auckland Council? I’d say the council put a lot of money into cricket pitches relative to the amount they get used and the number of people that use them. Is NZ Cricket putting up any money for this or are they just hoping ratepayers will fund the development of future players. The reason so many grades play on artificial pitches is because of the weather. That has nothing to do with a blimmin’ linear park. I’m not sure if you’re ever tried, but it’s extremely labour-intensive work to turn out a half-decent turf wicket in Auckland. It rains. A lot. You’d have to spend tens of millions on ground staff, re-laying, drainage…all for what is a minority sport (albeit one close to my heart). In terms of utility per dollar, it’s much better to spend that money in a well-used public amenity than a grassy luxury that gets used once per week for four months of the year. It funded by the city centre targeted rate retard. If you want to fix your sports fields then put a targeted rate on your neighbourhood. Otherwise piss off and let the city do what it needs to do. Why does the city need to do it? Does Victoria St fail to allow the free movement of pedestrians in its current state? 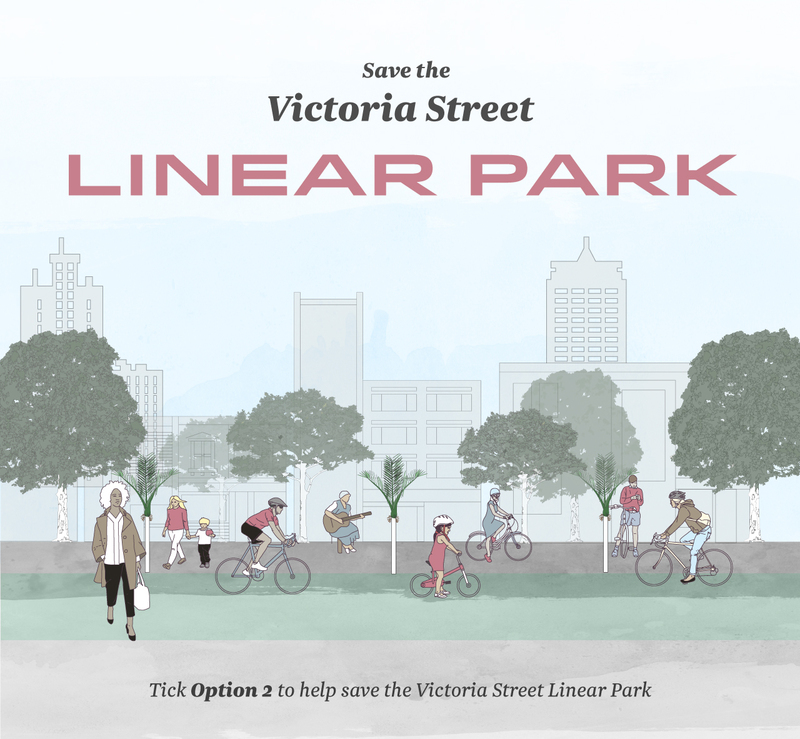 Will the linear park improve pedestrian speeds along Victoria St? Yes, perhaps if you have never walked on Victoria Street then you shouldn’t comment on it’s pedestrian function. P.S. streets are not exclusively for movement. It’s about to become the link between Auckland’s busiest train station and Queen St and it’s pretty close to failing now. I think this will be a good outcome in the long run, especially when CRL and LRT are in place. The difficulties the conventional transport planners have with this sort of project highlights the urgent need to change the way we plan transport in New Zealand (and Australia). When planners model travel demand, they do it using “static” models of demand. We should be using LUTI (land use transport interaction) models linked to our travel models. But we do not. So we really struggle to come to grips with projects that will fundamentally change behaviour. Our models are designed to handle “more of the same”. Transport planners need to either develop new models, or a new methodology. The latter is not as radical as it sounds. We could plan most of our transport infrastructure by benchmarking vs other similar sized cities, of which there are many. Worth looking at what the EU now does with Sustainable Urban Mobility Planning. Things like the Linear Park would not have been problematic. Of course, we really do need to define CBD bus corridors, and a CBD bus depot too. I believe it is a good opportunity to simplify the city central bus stop locations and the routes. Ideally it should simplify the currently fragmented, inconsistent, and complicated bus map by only having only a few main corrdiors and stations. That enables prople to understand the bus routes easily and make transfer without having to download multiple maps and study all the different combinations of bus and stops. Ideally it should be like a simple grid network. Isn’t that AT’s plan anyway, post-CRL? This is great! Let’s have more public spaces, not less, and put a stop to council and government selling off our public spaces for private profit such as at Point England and numerous places around the North Shore. I really hope that the stormwater people at Council can be involved in the final design of the Linear Park. The plentiful impervious surfaces catching rain and the ample slope of Victoria St provide a fantastic canvas for some innovative placemaking water features. We also need to be planting the endangered lowland species that – unlike highland species hidden away from people – have been ignored almost to extinction. What better public place to combine the two in a bold and beautiful dynamically-changing ecological feature? Doesn’t need to be big. Just fun. Now thats a really great idea, a series of staggered ponds and waterfalls, water rapids with pedestrian footbridges over them. Maybe a glassed over section forming a suitable wet micro climate for some native plants and associated fauna. If this grafton bus depot idea means the busses go straight down symonds and turn right to grafton somewhere, instead of the current plan where they go across town east to west on wellesley street, then that will drastically reduce their coverage of the city. We need routes that go into and through town, no terminate at the edge of town and force an enormous walk or another transfer. I think it would be for the ones coming from the other direction. Mainly/maybe only Northshore buses, ie the NX2 on the new network.